By now you have probably heard of the site Pinterest. It's a way to keep track of things that catch your interest on the web, sort of an online scrapbook, and you can see what other people find interesting too. Whenever I need some inspiration I'll go on and see what other people are pinning. Recently I saw a pin of Easter eggs made out of yarn. 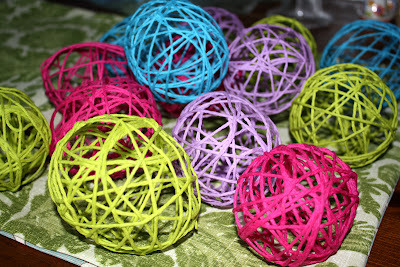 The pin didn't link to a how to site, but I googled "yarn eggs" and found a few sites. Simply Modern Mom had easy to follow directions that I added a couple of tweaks to use things I had on hand (because I forgot to buy things at the store.....oops!). First to get the egg shape you will need some small balloons like water balloons. These were impossible to blow up by mouth so I found a cheap balloon pump at Target to help out with this step. I got Brian to fill the balloons because I'm always worried they are going to pop on me! I did the the tying and releasing air to get desired sizes. I didn't worry about getting them all the same size, but Brian was going a little overboard on the balloon filling so I had to release some of the air, we weren't going for dinosaur size eggs! This was a pretty messy project so I put down wax paper over my work surface. 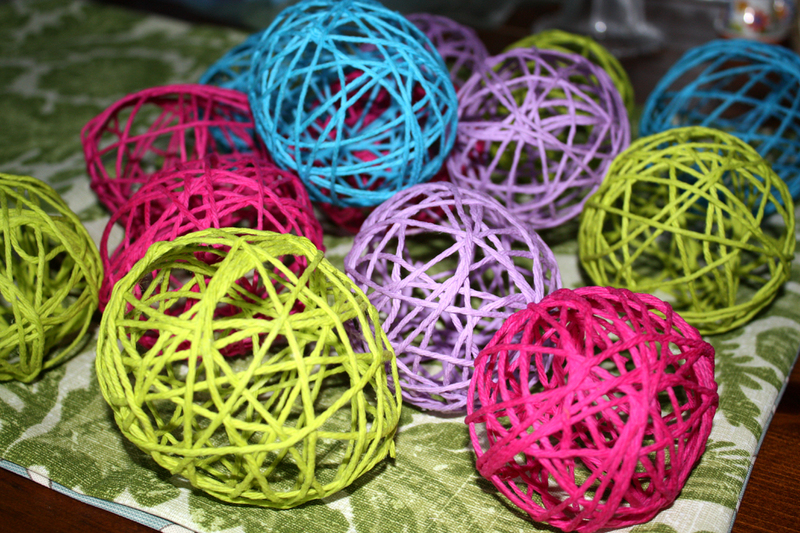 Simply Modern Mom suggested rubbing the balloons with vaseline to prevent the yarn from sticking to the balloons at the popping step. I didn't have any vaseline so I used vitamin E oil I had, I figured the main point was to prevent sticking so figured oil would work?? Then I prepared my yarn soaking glue mixture. 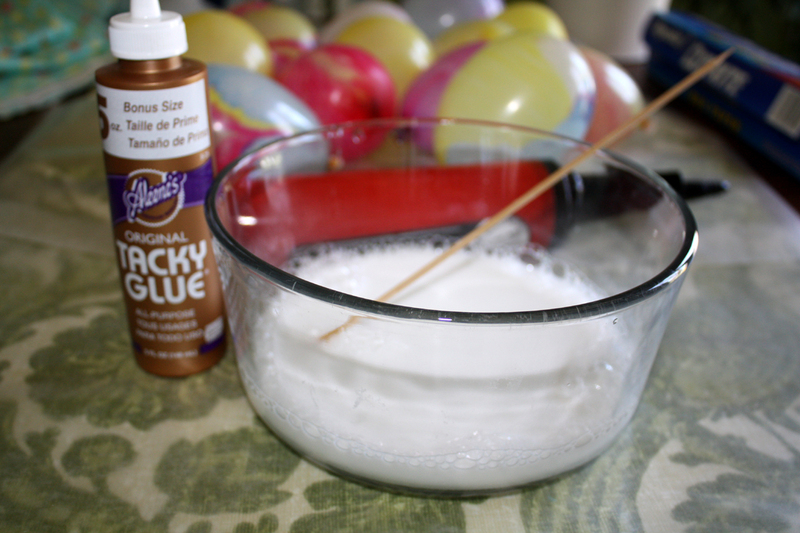 I used a mixture of 3:1 water to craft glue and made sure to mix it well. 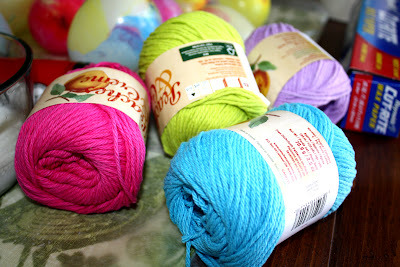 I bought a few colors of yarn that I thought were Easter colors (and were cheap at Walmart). Not the normal pastels, but fitting for the brighter decor of our house. 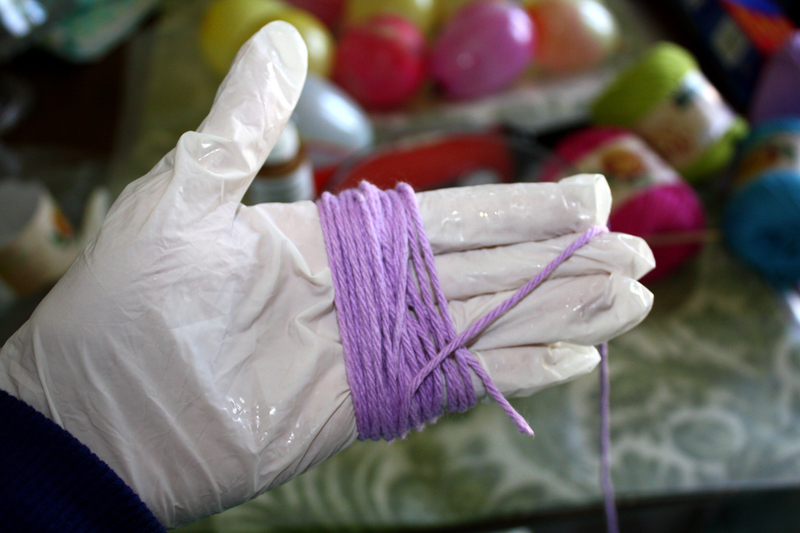 I measured out the approximate amount of yarn to use by wrapping it around my hand. Depending on how dense you want the yarn to cover the "eggs" you can use more or less than I did. I wrapped the yarn about 30 times around my hand. I also wore gloves because as I said before, this is a pretty messy project! 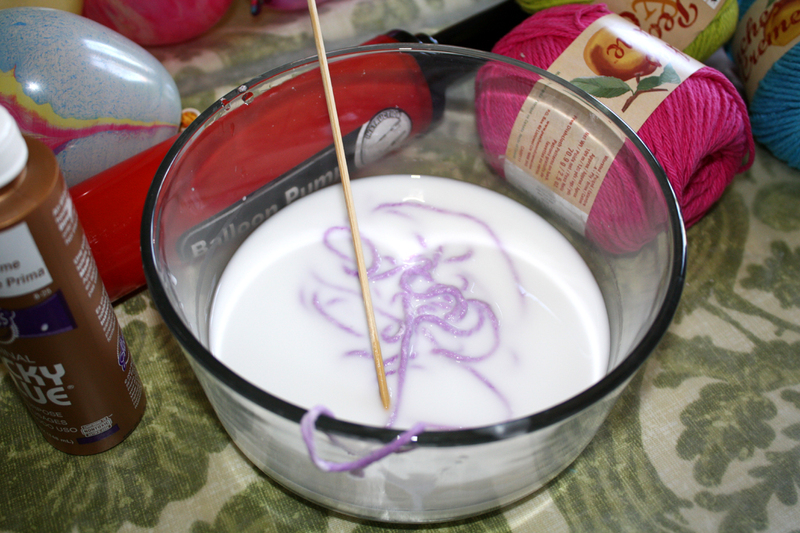 Then I soaked the yarn in the glue mixture. 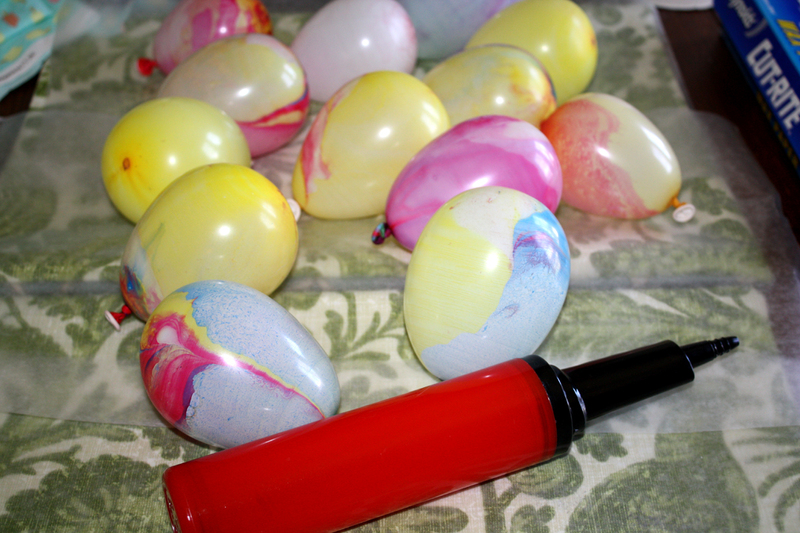 I squeezed out any excess liquid before wrapping it around the balloons. I wrapped the yarn around the balloons randomly trying to criss-cross over the entire balloon surface. When I was all finished with the wrapping I dipped the wrapped balloons in the glue mixture to make sure all the yarn was soaked. Then I left them on the wax paper to dry for 24 hours. 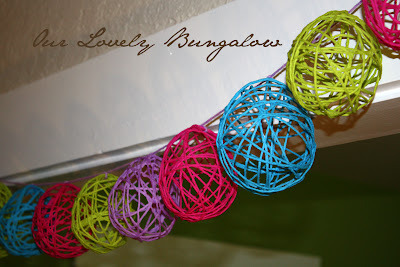 I also rearranged them after a couple of hours because excess glue formed puddles on the bottom of the balloons. After 24 hours I popped the balloons. I held the tied end of the balloon and popped them using a pin. I found the faster the pop the better as slowly deflating balloons sometimes pulled the yarn in with it collapsing the egg shape. 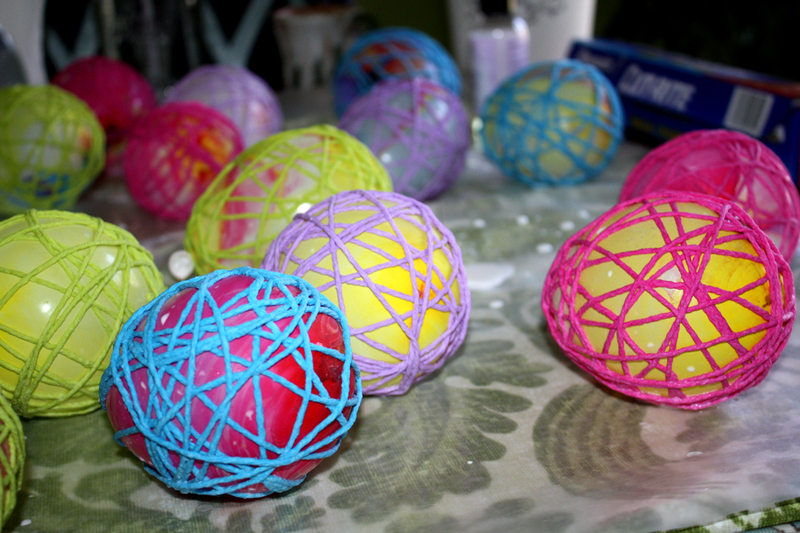 For a stronger egg I think using more yarn would be helpful, but the amount of yarn I used held the balloon shape pretty well. 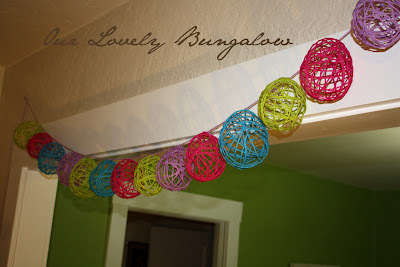 Lastly, I strung the eggs on a piece of yarn, tying the eggs to the yarn to hold them in place and hung the garland up in a doorway.